In what seemed to be a Hail Mary pass to revive his failing reelection bid, Corbett, his political business allies and the Fraternal Order of Police cynically set up shop on a sheltered, portable stage at the location where police officer Daniel Faulkner was shot and killed in December 1981. Political activist and journalist Mumia Abu-Jamal, who happened upon the scene, was framed by police for the shooting and subsequently served over 30 years on death row before being released into general prison population in 2011. Abu-Jamal maintains his innocence. 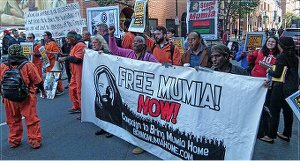 Free Mumia Now, Oct. 21. The same movement that has steadfastly fought to free Abu-Jamal responded on less than 24-hours notice to turn out on a weekday to confront the state’s latest effort to silence him. 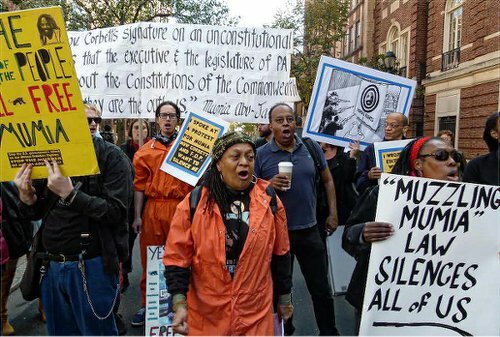 They were joined by prisoner rights groups and civil liberties forces that see the anti-Mumia law as a blanket attack on the constitutional rights of all prisoners and a dangerous precedent at a time when more attention is focused on mass incarceration. A large hand-lettered sign carried a statement by Abu-Jamal for broadcast by Prison Radio in response to the bill. It read, “I welcome Gov. Corbett’s signature on an unconstitutional bill that proves that the Pennsylvania executive and the legislature don’t give one whit about the constitutions of the Commonwealth or the U.S. 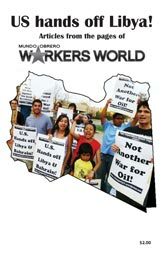 It proves that they are the outlaws,” signed Mumia Abu-Jamal. The demonstrators who turned out today made it clear that the state’s efforts are in vain. They stayed in the street for an impromptu rally that continued for some time after the Corbett forces abandoned the area. A day of activities is planned for Oct. 22 to broaden the movement to free Abu-Jamal and to observe the national day against police brutality and mass incarceration.